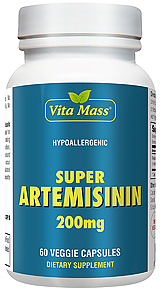 Artemisinin (pronounced /É‘Ë�tÉ™'misinÉ™n/) is a drug used to treat multi-drug resistant strains of falciparummalaria. The compound (a sesquiterpene lactone) is isolated from the plant Artemisia annua. Not all plants of this species contain artemisinin. Apparently it is only produced when the plant is subjected to certain conditions, most likely biotic or abiotic stress. It can be synthesized from artemisinic acid. The drug is derived from a herb used in Chinese traditional medicine, though it is usually chemically modified and combined with other medications. Use of the drug by itself as a monotherapy is explicitly discouraged by the World Health Organization as there have been signs that malarial parasites are developing resistance to the drug. Combination therapies that include artemisinin are the preferred treatment for malaria and are both effective and well tolerated in patients. The drug is also being studied as a treatment for cancer. Images of the original scientific papers are available online and a book, Zhang Jianfang, "Late Report – Record of Project 523 and the Research and Development of Qinghaosu", Yangcheng Evening News Publisher 2007 was published in 2006, which records the history of the discovery. It remained largely unknown to the rest of the world for about ten years, until results were published in a Chinese medical journal. The report was met with skepticism at first, because the Chinese had made unsubstantiated claims about having found treatments for malaria before. In addition, the chemical structure of artemisinin, particularly the peroxide, appeared to be too unstable to be a viable drug. To counter the present shortage in leaves of Artemisia annua, researchers have been searching for a way to develop artemisinin artificially in the laboratory. A 2006 paper in Nature presented a genetically engineered yeast that can synthesize a precursor called artemisinic acid which can be chemically converted to artemisinin. The compound called OZ-277 (also known as RBx11160), developed by Jonathan Vennerstrom at the University of Nebraska, has proved to be even more effective than the natural product in test-tube trials. A six month trial of the drug on human subjects in Thailand was started in January 2005. There are also plans to have the plant grow in other areas of the world outside Vietnam and China (Kenya, Tanzania, Madagascar).